With the raft riding right side up, the next task was for our volunteer survivors to gather around the raft and get in it. Before getting in, just gathering around presented some differences and difficulties worth noting. The rafts all had lifelines strung around the raft, but where they were strung made a great deal of difference in how easy they were to grapple. 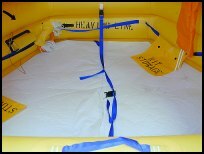 The lifelines on the single tube EAM and Hoover rafts are narrow white nylon tape which may be adequate from a strength standpoint, but is hard to see against the yellow raft and difficult to grip with cold hands. The EAM has only a single lifeline and it is inside the raft, a very poor design in our opinion and a critical failing. It cannot be easily seen from the water's surface even when right side up and is very difficult to grab in any case. It is useless while the raft is overturned. The Hoover has its lifeline strung along the mid point of the outer side of the tube. The double tube Hoover had a somewhat more substantial 1-inch white nylon webbing lifeline strung along one of the tubes approximately midway between the centerpoint of the tube and the joint between the two tubes. It does not extend to the entry, stopping short in the adjoining segment. Survival Products uses 3/4 inch black nylon webbing making it easier to see. It is strung around the middle outside of the tube on single tube rafts. On the double tube raft it is strung along the upper tube. The RFD Navigator uses 1-inch white nylon tape. The exterior lifeline is only on the sides and not the rear, an odd setup and not a very good one in my opinion. 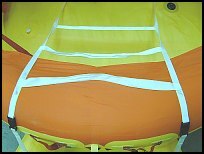 The RFD "R" series raft was equipped with 1 inch white nylon tape line as well. The exterior life line is attached tautly to the center of the covering over the arch tubes. Once the arch tubes are raised, there is no lifeline. This could be a problem since it means that the canopy might not be able to raised until almost all survivors are in the raft. It could also be a problem when you have an overcrowded raft and some survivors may have to stay in the water. This was not likely a design consideration, since no one is going to stay in the water in the cold North Sea. In more temperate areas it might be a viable proposition and even a desirable one in some circumstances. Air Cruisers uses blue lifelines on the 4-person raft, red lifelines on the 13-person. Both are 1-inch nylon webbing attached near the joint between the tubes on the lower tube. Winslow uses very substantial two-inch blue webbing for lifelines on all but the Ultra-Light which uses one-inch blue webbing. (NOTE: this has changed from mixed blue and black as pictured on our test rafts and we think it's a change for the better) The exterior lines are staggered up and down, from the mid point of one tube to the other on the double tube rafts and low and high on single tube designs with the exception of the RescueRafts. This makes it easier to grab, no matter what the position of the raft. The life line stops in the middle of the section adjoining the primary entry. We'd prefer to see it continue closer to the entry point. On the RescueRafts the lifeline runs along the top center of the tube, which we don't particularly like. Because it runs from the midpoint of each section, it necessarily bridges across the interior, placing it further from anyone on the outside and making it somewhat difficult for survivors to see it from the water level and impossible to locate if the raft is inverted. It would work better if it were secured to the tube at the ends of the section, as Winslow does with their interior grab lines to prevent bridging problems. We prefer high contrast lifelines, such as the blue used by Winslow and Air Cruisers and Red used by BFGoodrich and Air Cruisers. Black is OK, but doesn't seem to stand out as well in dim light as the brighter colors. Wide is better than narrow, being much easier to grip, especially in the cold. With the exception of the RescueRaft and Ultra-Light, Winslow's lifelines are the class of the industry. Entry into the raft is one of the most critical phases of a survival situation. If you cannot get into the raft, it doesn't matter how good it is. While the preferred method is to step off thew wing into the raft--completely dry--there is no guarantee that will occur and you cannot plan on it. The optimal entry aids would allow an adult of any stature or weight to board the raft unassisted, even with an injured leg or arm. The wave pool was especially effective at revealing some shortcomings in boarding aids that likely would not have been noticed in calm water. It is one thing to board a raft when everything is steady, another thing again to do so when the raft and the water are both moving. The most critical entry is always the first. There is no one on board to assist and there may not be anyone else around to help in any case. Even when there is multiple crew or passengers, in the end there may well be a lone survivor on only a single able-bodied survivor. While you would expect the single tube rafts to be easier to get into because they have less freeboard, this was not necessarily the case. Certainly it is relatively easy for someone who is physically fit to pull themselves into a single tube raft simply since it is lower and closer to the water. With the adrenaline rush from a ditching, boarding can be even be easier. However, frigid waters can have a very rapid and extremely deleterious effect on strength and the sense of touch and even someone who might otherwise have no problems may have great difficulty getting into a raft without assistance of some sort. In addition, injuries can occur in a ditching and not everyone is physically fit nor big and strong enough to do it with little or no help. In fact, that is more likely the case than not. As it turns out, ease of entry is as dependent upon the aids on the raft designed to assist the survivor as it is on how far the raft rides out of the water. Adequate and effective entry aids are vital. Experience has served to emphasize the difficulty that some body types have in boarding. Persons of short stature or who are very heavy present different problems than the average size person. Women, especially, seem to generally lack upper body strength in comparison to the average male. That upper body strength is especially valuable and a big advantage in most boarding scenarios. Women (not me. I value my life) have attributed this to the basic difference in physique, with women generally being more bottom heavy than males, compounding the problem. Women need to be able to utilize their greater lower body strength while boarding or they will have a more difficult time of it. Heavy persons also need to rely more on lower body strength. To take advantage of lower body strength, there must be adequate purchase for the feet against which to leverage the body up. Aids to entry fall into two categories, foot holds and hand holds. Both are necessary to be really effective. Those of short stature may need additional aids to allow them to get up and over the buoyancy tube(s). Especially with an inflatable life vest on, they may have trouble reaching grab handles and inside boarding ladders that are an easy reach for the average person. Survival Products has no foot holds to offer purchase on their single tube rafts. The unapproved raft has only only a single token grab handle on the floor of the raft at the boarding point, which was of little help. On the TSO'd Type II the lifeline is attached higher up on the tube on either side of the dual opposed entries and there is a grab strap stretched across the floor between the two entries. Neither was a great deal of help. Better than nothing, but not much better. At one entry the gas cylinder's inflation valve pokes out from underneath the raft in the center of the entry point, just waiting to injure anyone boarding at that point. Overall, the Type II's boarding aids were inadequate, entry was difficult for many and the raft is easily swamped. EAM has a single extra long loop of line hanging down at the boarding position which is easy to miss. There are also three white nylon webbing handhold, one on top of the tube, one midway down the inside of the tube and one on the floor, as well as the inside lifeline. The foot sling wasn't much help at all, even if the survivors found it, but the hand grips were more useful. Even so, the boarding aids are inadequate. Hoover uses a two rung ladder with semi-rigid flat rungs made of two inch white webbing hanging down at the entry. Some sort of hard flexible material is sewn between two pieces of webbing to make the rungs. This entry aid isn't too bad in concept, we like the flat, weighted rungs a great deal, but Hoover defeats their efforts by not making the ladder long enough. It just barely hangs down below the bottom of the tube making it very difficult to get a foothold on them while still maintaining a grip on the grab handle(s). For some it was virtually impossible. After our 1996 tests they added another step to their larger transport category rafts, but so far this improvement has not trickled down to the general aviation rafts. 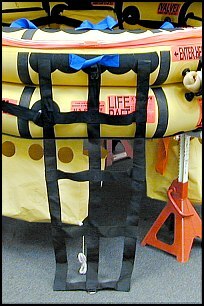 On the single tube rafts there is a grip handle on top of the tube, one inside on the tube and the inside lifeline. On the double tube FR-6 raft the grab line doesn't extend across the entry. Another grip handle is added to the midpoint of the tube, inside and out. In addition, the entry is flanked on both sides by the exposed wire running from the battery to the locator light attached to the top of each tube. Not unexpectedly, the locator light was pulled from its mounting during the boarding tests. It's attached with a snap, so no physical harm was done, but it would be easy to get tangled in the loose wire, which would be a more serious problem. It's a poor place to put that wire. TIP: If the survivor doesn't have considerable upper body strength to pull themselves up and over carefully, the only sure solution to the sort of boarding problems we found with the Hoover or Survival Products rafts is to position another survivor on the opposite side--if there is another survivor. If not, you might be in big trouble. Another possible solution if by yourself and the wind cooperates: place the wind at your back, always a good idea when boarding a raft, and it will help blow the raft back down when it picks up. Boarding aids for the RFD Navigator are centered on the open entry. They consist of a single 1 inch nylon tape loop with a heavier nylon webbing reinforced "step" at the bottom of the loop hanging down at the entry and a 1 in. nylon tape "V" shaped interior boarding "ladder" with a grab handle/rung near the exterior top of the tube and a second small rung in the interior. The end of the ladder is secured permanently to the floor of the raft. It could be cut loose to get it out of the way using the raft knife included in the SEP. While the entry aids are somewhat rudimentary, they worked reasonably well for the relatively low freeboard they had to deal with. 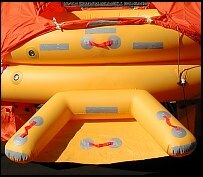 The RFD "R" series raft is fitted with a semi-rigid inflatable boarding ramp at the primary entry. This entry is comprised of a splayed "U" shaped inflated tube that sticks out from the raft. The bottom of the "U" is hinged at the attachment point using a heavy rubber hinge joint. Between the splayed side tubes is white open mesh netting which provides relatively non-slip purchase. A 1-inch white nylon tape grab handle is attached in the center of the mesh platform about 2/3rds of the way up the ramp. The white handle on the white mesh doesn't offer a lot of contrast. Two other grab handles are fitted, one at the hinge point and one on the top of the main tube. In general, it is relatively easy for even a weak or injured person to pull themselves up the ramp and into the raft, resting on the ramp if necessary. However, I noted that with very heavy survivors the ramp's buoyancy may be overcome, leaving the survivor with little or no leverage against which to push, making boarding very difficult, if not impossible. If anyone of normal size tries to stand on the bottom half of the ramp, as I saw done, it will also collapse under them as well. While I very much like the boarding ramp concept, I have some concerns over the performance with heavy survivors. I would like to see improved buoyancy and/or some means added to give a survivor a foot hold if the ramp is collapsed under them. It would also be helpful to add more and easier to see grab handles. An inside boarding ladder wouldn't hurt, especially so if they don't improve the ramp's buoyancy. The ramp has the potential to be a superior entry design. For those of more normal build it received a big thumbs up. It must be noted that part of the ramp's success is attributable to the relatively low freeboard of the "R" series raft, one of its less notable attributes. 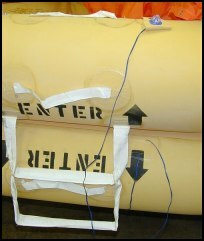 While it is a double tube design, the floor is placed in between the tubes, resulting in the raft floating much lower in the water than a traditional double tube raft with the floor on the bottom. TIP: Many people seem confused by the concept of buoyancy as applied to life rafts. The bottom line is that a life raft is no different than any other "boat." Its buoyancy comes from the weight of the volume of water which is displaced by the surfaces of the raft in contact with the water. This based on Archimedes' principle that most of us learned in school. 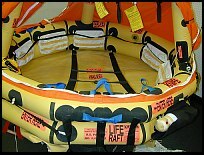 Since the weight of fresh water is about 62.4 lbs/cubic ft. (sea water is about 64 lbs/cubic ft.) and many general aviation life rafts don't even weigh that much, conventional rafts with a floor at the bottom, and thus large surface area, tend to float very high in the water when empty. A reversible raft without a floor at the bottom displaces water only via the buoyancy tube itself that is in contact with the water, a much smaller volume, and therefore it tends to rides lower in the water. Our raft was equipped with only a rudimentary two rung 1-inch white nylon strap ladder at the secondary entry. A single grab handle is provided at the top of the ladder where it attaches to the top of the upper main buoyancy tube. It was pretty poor and seemed to simply be an easy answer to a regulatory requirement. Since the second entry hardly really matters in a small raft, this isn't a real concern. Eight person and larger rafts have boarding ramps at both entries. However, the mooring lines are attached to the raft at the secondary boarding point, not the one with the boarding ramp. While this may make it easier to bring the raft alongside a helicopter on floats, it creates problems in other situations where a dry boarding isn't possible. We believe that the mooring line should bring survivors to a primary entry point with the best boarding aids. Survivors will have enough problems without misdirecting them to a more difficult entry point. Air Cruisers also use an inflatable ramp style boarding aid for the primary boarding location. While there are minor differences in construction, they don't seem material to the effectiveness of the ramp. On the 4-person raft the ramp is mounted between the tubes, on the 13-person it is mounted below the midpoint of the bottom tube. On top of each side is a 1-inch blue or red (4 or 13-person respectively) webbing grab handle running parallel with the tube, a single grab handle is attached to the floor of the ramp about 1/3 if the way up. The 4-person also has a handle on top of the ramp tube in the center and on top of the upper tube, the 13-person has one midpoint on the upper tube on both the interior and exterior. The handle webbing is twisted to make them easier to grab. The alternate entry on both rafts incorporates a very nice three rung ladder of 1.75 inch white webbing with flat sewn-in semi-flexible steps (like Hoover). It extends well below the bottom of the raft, which is excellent, though it wasn't immediately apparent to some who tried it. A handhold is affixed midpoint on the upper tube and on the top or inside on the 4- and 13-person respectively. The canopy and its entry door present a problem. On both rafts the door is rolled down and tied where it crosses the entry point. On both rafts some testers grabbed hold of this rolled up fabric to pull themselves on board, risking damage to the canopy. Worse, one tester having difficulty boarding grabbed hold of the edge of the canopy and ripped it apart at the zipper seam. Taking a page from Winslow's book, inside the raft both provide a means to assist hauling oneself into the raft. On the 4-person there is a slack 1-inch blue webbing line that runs across the life raft from the midpoint on the upper tube and is secured to the floor in the middle with a plastic snap buckle. There are two handhold loops sewn into the line on each side. While the line is somewhat useful to pull yourself into the raft, far better than nothing, the loops were ineffective because they are not easily grasped since the flat webbing lays together and they flop underneath the line. With cold hands, when needed the most, grasping the line would be especially difficult. The 13-person has a pair of vee shaped ladders constructed of red 1-inch webbing. The ladders are connected together and secured to the floor at the center with a plastic snap buckle. Each has three rungs. These proved very effective from those with arms long enoughand strength enough to reach over the high tubes, grasp them, and pull themsleves on board. Shorter and bottom heavy testers had a very difficult time of it. Plastic snap buckles at each end allow survivors to completely remove the interior boarding aids. Two testers were unable to board the 13-person raft from either the primary or alternate entry. [Click to view sequence of failed boarding attempt] This is a critical life threatening deficiency. Previous BFGoodrich designs had absolutely abysmal entry aids, the worst of any. In an effort to do better, BFGoodrich came up with their version of a boarding ramp. The one on the prototype raft we tested in 1996 had some serious problems and BFGoodrich made some major changes before certification as the result of our tests, which substantially improved upon it. On the BFGoodrich rafts there are a pair of tubes which project out from the raft at the entry. These are rigidly attached to the raft and a pair of straps goes from the raft upper buoyancy tube down to the tubes, near the ends, to keep them from bending down when weight is placed on the platform. A large hoop of fabric hangs down below the raft as a sort of broad "step," "porch" or "platform" (pick your descriptive term), supported by the rigid side tubes. Height to the top of the upper tube is about 28 inches, which proved very comfortable for all. It is strong enough to easily support even a heavy person standing on the porch. The platform is made of buoyancy tube material with a triangle arrangement of six large round holes cut into the center of it, in an effort to allow it to settle down in the water. The holes are large enough that someone with small feet might get caught up in it. A double layer of material reinforces the area with the holes. BFGoodrich provides plenty of red 1-inch webbing hand holds. While not twisted, they are constructed so they tend to pop-up from the tube making grasping them easier. There is one along the top forward part of each support tube and one centered on the entry above the midpoint of the lower tube and a pair next to one another above the midpoint of the upper tube. I have some concerns about how the large hoop of fabric will function in heavy waves. In our testing it tended to float up and was not all that obvious until someone either demonstrated it or someone else figured it out for themselves and then everyone else followed. Short survivors had a bit more difficult time with it, but everyone boarded with minimal difficulty and gave it a big thumbs up. Some weights to force the hoop of fabric to drop and stay down as well as an outside boarding ladder added to or attached to the hoop might result in an even better entry. One platform entry is installed at both ends of the raft on the lager rafts, only a single platform entry on is fitted to the 4 person. The other entry on the four person is a single 1 inch nylon webbing loop hanging down approximately 12 inches from the bottom tube and grab handle on the top of the tube. While totally inadequate as a practical entry, on smaller rafts (six person or less) the second entry is substantially redundant, in my opinion, a regulatory rather than functional requirement, so this is not a significant deficiency. BFG have also adopted Winslow's inside boarding ladder concept with a three rung inside ladder of white 3/4 inch nylon tape with 1 1/2 inch nylon webbing rungs, one directly on top of the upper main buoyancy tube. The canopy door is rolled down to the tube, but is secured tightly to the tube and with the ladder rung laying on top of it, it's far less of a potential problem than that of Air Cruisers. The ladder is attached permanently to the raft floor at both bases and extends over the upper tube and is attached to the boarding platform legs with plastic snap buckles. These must be released to close the canopy door. It proved an annoyance in the midst of the survivors, even when released, but it could be cut loose from the floor using the raft knife to get it out of the way, though this isn't the most elegant solution, especially compared to both Air Cruisers' and Winslow's snap clips. The Winslow rafts all share the same basic excellent entry aids. TSO'd double tube rafts get two entries in accordance with the TSO, others just a single one. Attached to the midpoint of the tube (upper tube on double tube rafts) is an immense three or four rung boarding ladder, depending on freeboard. It is constructed of two inch blue nylon webbing with a center web to maintain its shape in use. This is a viable alternative to the flat weighted rungs used by Hoover or Air Cruisers, which we prefer. The ladder narrows towards the bottom, which we don't like so much. At the primary entry single tube rafts are fitted with a single grip handle on top of the tube. 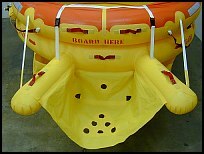 Double tube rafts have one handle in the midpoint of the upper tube and three handles along the top of the upper tube. The alternate entry has only a single grip on the top of the tube and the interior grab line below. All are bright blue, 2-inch webbing and twisted and bowed so they are easy to grasp. 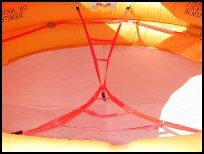 The larger rafts with higher freeboard also have a pair of "stirrups" on either side of the entry ladder attached to the bottom tube. We wondered about their usefulness, but turns out a few testers found them and liked them. At the primary boarding point there is an internal boarding ladder which is stretched from the top of the tube into the bottom tube across from the entry and secured with quick release clips. There are three rungs on this ladder which is also constructed of easy to grasp 2 inch webbing. The interior boarding ladder can be disconnected for calm weather or remain in place as a brace point in heavy seas, space permitting. The single tube rafts were a breeze to enter, no other single tube comes close. Despite the higher freeboard of the twin tubes, they were also relatively easy to enter because of the well thought out design. The secondary entry point was not nearly as effective, missing the inside boarding ladder. For those with an injury, the ladder design wasn't as easy as the boarding ramp, but most of our "injured" still managed to get in, albeit with considerable difficulty on the double tube rafts. At the alternate boarding location, Winslow placards the raft with "ENTER HERE" arrows pointing to that boarding point ladder. I'm of the opinion that all survivors should be directed to the primary boarding point unless there is no difference in boarding aids. The FAA says the second entry must be there, but nothing says the survivors must be directed to a more difficult entry point. Winslow attaches their mooring line to the bottom of the boarding ladder. This has both advantages and disadvantages. I would prefer to see it attached directly to the raft, adjacent to the boarding point. This would make it much easier to detach or cut the mooring line, no matter if someone is in the process of boarding. Otherwise, you must wait until you can pull the ladder in to reach the end of it where the mooring line is attached. On the other hand, having it attached to the ladder does mean a survivor is led right up the ladder, making it hard to miss. A final note on entry aids. Experience has shown me that a boarding ladder is a universally understood entry device. Test subjects easily recognize and understand how to use it. If it is adequately designed, and the Winslow is a good case, it works well. By the same token, the best inflatable entry aids, combined with an interior boarding ladder, are even easier to use. Between the aviation and marine rafts we saw a wide variety of inflatable entry aids, some worked far better than others. The very best we saw was on a marine raft by DBC Marine of Canada. Moreover, it was stone simple. This is not rocket science and it doesn't have to be complicated or heavy. In our opinion, none, I repeat, none of the existing inflatable entry aids on the aviation rafts appear to meet the requirements of TSO-C70a, para. 4.6: "Puncturing of inflatable boarding aids must not affect the buoyancy of the raft buoyancy chambers." We consider this a significant failing. Our tests of marine rafts has shown that meeting this requirement is not impossible, they all did so.